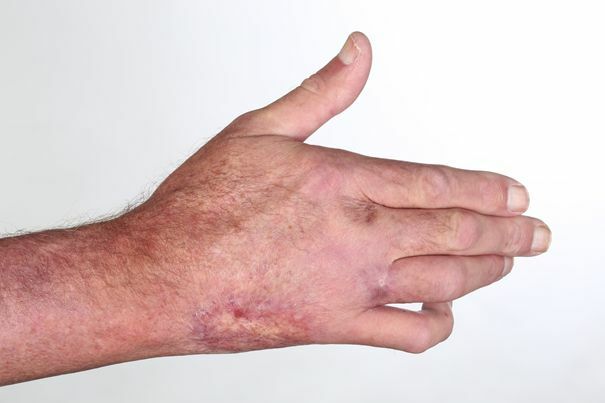 A 60-year-old man presented to our outpatient clinic with a skin-colored nodule on the dorsum of his right hand. 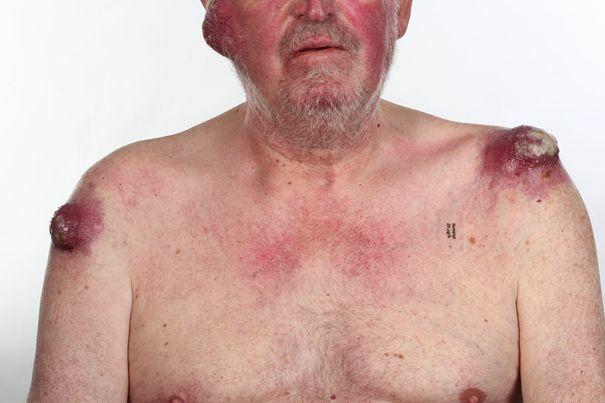 Physical examination and ultrasound revealed three more nodules growing on his right lower arm. 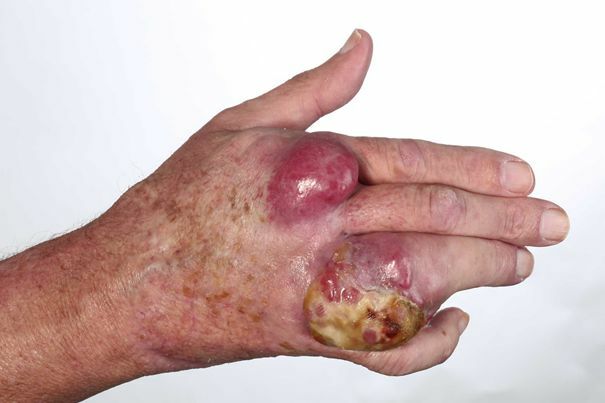 An excision of the nodule on the right hand showed a tumor cell nests with atypia, mitotic activity and tumor necrosis as well as infiltration of lymphatic tissue. Immunostainings showed negative findings for melanocytic markers and positive findings for keratinocyte markers as well as for Cytokeratin-20. The diagnosis of Merkel cell carcinoma was made. The nodules on the right hand and right lower arm were completely excised. Additionally, radiotherapy with 64 Gy has been administered. After 6 months, new loco-regional and distant metastases were detected by physical examination and PET-CT. A subcutaneous metastasis developed on the right 5th finger. Furthermore, metastases at the dorsal neck, in the lung, in the humerus and in the os ileum were found. 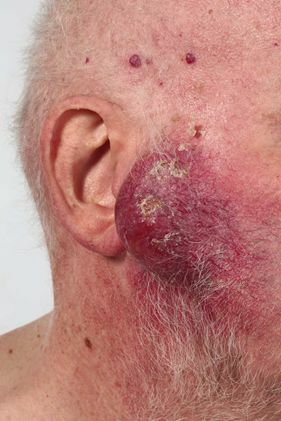 Stage IV Merkel cell carcinoma was diagnosed. A systemic therapy with Carboplatin (AUC 4) and Etoposide (80mg/m2) was started. Progressive disease was diagnosed by PET-CT after four cycles of chemotherapy. Multiple bone metastases, soft tissue metastases and progressive lung metastases were found. In this situation, the tumor board recommended treatment with an anti-PD1 antibody in off-label situation. His health care provider was contacted and finally a decision for reimbursement was achieved. 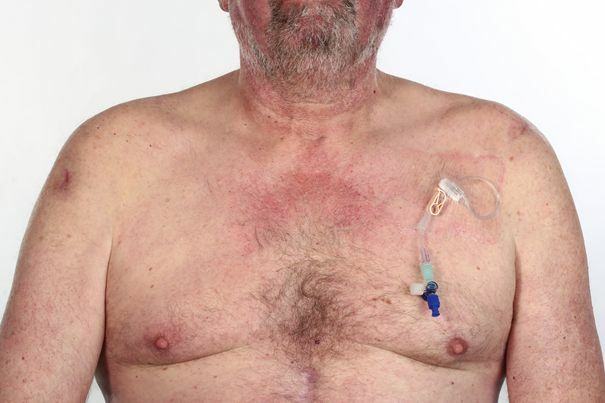 In March 2016 treatment with pembrolizumab (2mg/kg Kg) was started, in combination with radiotherapy in multiple locations with subcutaneous metastases. The first staging in June 2016 already showed partial remission with decreasing diameter of all metastases. In September 2016, a new CT-staging showed further regression of metastases and in December 2016, the CT-staging only detected residual bone defects and residual enhancement nuchal without a clear tumor manifestation. Until the end of 2016, 14 cycles of pembrolizumab have been administered. At the end of 2016 the interdisciplinary tumor board judged the response as complete response. Kaufman HL, Russell J, Hamid O, Bhatia S, Terheyden P, D'Angelo SP, et al. Avelumab in patients with chemotherapy-refractory metastatic Merkel cell carcinoma: a multicentre, single-group, open-label, phase 2 trial. The Lancet Oncology 2016;17(10):1374-85. Nghiem PT, Bhatia S, Lipson EJ, Kudchadkar RR, Miller NJ, Annamalai L, et al. 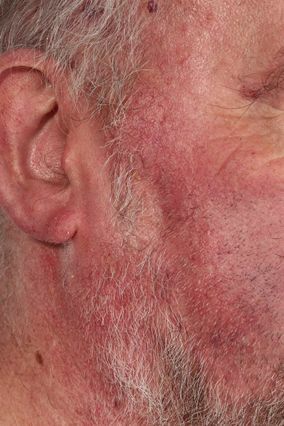 PD-1 Blockade with Pembrolizumab in Advanced Merkel-Cell Carcinoma. The New England journal of medicine 2016;374(26):2542-52.